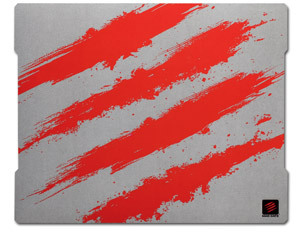 Give your gaming mouse a place to call home with the G.L.I.D.E.5 Mouse Pad from Mad Catz. Constructed from premium microfiber-covered foam with a high-grip rubber underside for dependable stability, the low-friction coating facilitates smooth mouse movement with effortless control. Custom materials and colors enhance your mouse's sensor performance to give you a distinct advantage over online rivals. *Mad Catz R.A.T. Gaming Mouse sold separately. Although the G.L.I.D.E.5 works great with laser sensors, meticulous attention to the surface's material and design help ensure optimization with optical sensors. Optical sensors utilize a tiny camera which takes pictures of your mouse pad - - thousands per second - - and then analyze those images to translate them into mouse cursor movement. The precise weave pattern of the material coating the G.L.I.D.E.5 ensures that your optical mouse's sensor receives incredibly accurate information, resulting in trouble-free aiming in every game you play. Measuring a whopping 317 percent larger than the average mouse pad, the double-XL surface area is ideal for gamers whose style of mousing is low in sensitivity. When you prefer to keep your DPI low - - and lots of mouse movement translates into very little in-game aiming movement - - an oversize mouse pad is a necessity. Mouse movement on the G.L.I.D.E.5 is 13 percent smoother than mouse pads constructed from comparable materials. Carefully selected materials coupled with an ultra-smooth surface texture promote flawless mouse tracking.